Ganesh (also known as Ganesha, Ganesa, Pillaiyar, Ganapati, and Vinayaka) is one of the most recognized of Hindu dieties. He is easily identified by his elephant head. In addition to being worshipped by Hindus, Ganesh is also revered by many Jains and Buddhists. Ganesh is known as the Remover of Obstacles, and regarded as the Lord of Beginnings and the Lord of Obstacles. He is considered a patron of the arts and sciences, and the deva (diety) of intellect and wisdom. Ganesh is very commonly depicted in Indian art, but may be shown performing many different activities. Ganesh is said to be the son of Shiva and Parvati. Although Ganesh is always shown with an elephant head, there are many different stories and myths about how he got it. In some stories, he is born with an elephant head, but in other stories, he acquires it. In one common story, Ganesh was created from clay by Parvati to protect her, but Shiva beheaded him when he came between Shiva and Parvati. Subsequently, Shiva replaced Ganesh's original head with an elephant head. In another story, Ganesh was created from Shiva's laughter, but Shiva gave him the head of an elephant and a protruding belly so as not to be too alluring. Please see our other listings for more designs. THE BLESSING OF LORD GANESH GANAPATI HINDU ELEPHANT GOD STATUE COLORED & GOLD . AN AUSPICIOUS GIFT FOR YOURSELF & OTHERS. 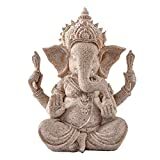 This beautiful statue represents five of the 11 principles behind the idea of a Ganesh figure-small mouth (talk less), small eyes (concentrate and focus), big trunk (adaptability and flexibility), big ears (listen carefully), and big belly (digest all good and bad in the world). EXQUISITE CRAFTSMANSHIP - Premium sculpted cold cast bronze by master sculptors- real bronze powder mixed with resin. Hand-painted in bronze finish with color accents to give a high-quality look without sacrificing the details. UNIQUE PRESENT - Packed in beautiful gift-box ready for any occasion. Ideal for friends or relatives who are ardent worshippers of Lord Ganesh. Ganesha is the God of all beginnings. He's an all-powerful, all-encompassing deity; yet, his appeal to millions lies in his everydayness. He'll help you get through that tough situation and he'll see that you reach your destination safely. He'll also hear your prayers for the success of just about any enterprise. It's his benign approachability that attracts the many superlatives around his name. 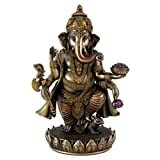 This Regal Top Collection Ganesha statue depicts Ganesha seated on a lotus pedestal. Rich bronze tones are further enhanced with red/green accents. Measures H: 7", W: 5", L: 4.5"
Material: Sandstone. Size: Approx. 10 * 9 * 13cm. This Ganesha was carved by thai artist and specially technique to look like vintage statue. IMPRESSIVE SIZE - Measures 25.25 inches (a little over 2 feet) tall. W: 17 by D: 16 inches. Amazing centerpiece to any decor at home or in the office. REMOVER OF OBSTACLES - Ganesha serves as a protector to bring success and prosperity into your life by helping to remove difficult obstacles. Measuring 25 inches tall, 17 inches wide and 16 inches deep, this magnificent Large Sized statue is a superb representation of Ganesh, the Indian Elephant God of Success and remover of obstacles. He is also known as the destroyer of vanity and god of education and knowledge. It is a wonderful adaptation in the tradition of Indian Art. Made with cold cast bronze, individually polished, antiqued, and painted with color accents, the definition and the intricate details of this piece are simply breathtaking. Even more so than the much smaller 7.25 inch version! The photograph does not do it justice. The special production process of this piece, originated from Great Britain, uses actual bronze powder mixed in the cold cast resin in order to ensures a richer, more life-like presentation. The hand-painted accents further add to the depth and dimension of this piece. This statue is much more beautiful in person and is heavy and very substantial feeling. It is truly a museum-grade product and an excellent representation of Hindu Art, very much worthy of your art collection or as the centerpiece for your personal altar. Invite Ganesh into your home today for good fortune and success!! Hindu elephant god of success - remover of obstacles. Beautiful polyresin golden home decor statues and figurines. 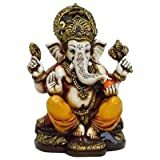 Top Collection 7.5" Standing Ganesh (Ganesha) Hindu Elephant God of Success. Remover of Obstacles. Real Bronze Powder Cast Statue. 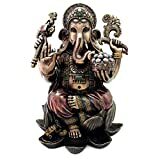 This is a Top Collection decorative figurine of Ganesha -the Hindu God of Success and Remover of Obstacles. Measuring 7.5 inches tall and 4.75 inches wide, this Hindu lord Ganesha statue is superbly detailed, very intricate for its size. This figurine is great on your altar, desk, display shelf, mantel or as a gift for any occasion. Ganesha is the beloved Hindu god whose protection will grant success, prosperity and overall good fortune as he removes obstacles in your life. All details in this amazing statue are painstakingly hand carved by master sculptors. Ganesha is the God of all beginnings. He's an all-powerful, all-encompassing deity; yet, his appeal to millions lies in his everydayness. He'll help you get through that tough situation and he'll see that you reach your destination safely. He'll also hear your prayers for the success of just about any enterprise. It's his benign approachability that attracts the many superlatives around his name.